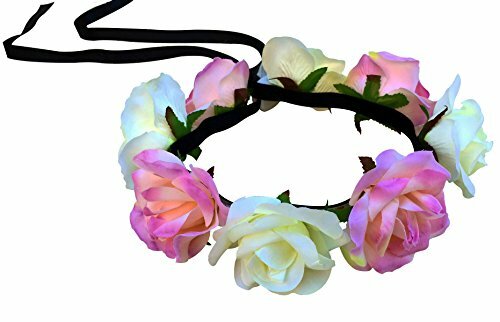 This beautiful flower headband is made of light yellow and pink artificial silk rose flowers carefully placed on an adjustable headband. Tie the headband around your head to secure it in place or wrap around your wrist to make a unique bracelet. Switch the LED lights on once the sun sets to make the flowers glow, blink or strobe. Uses CR2032 batteries – two batteries are included. Battery life is over 24 hours. Makes a wonderful accessory for weddings, birthday parties, music festivals and more!